We live down a dirt road on 20 acres of wooded wonderland... that's rural in my book! Since people have asked... here is a close-up of my avatar pic. 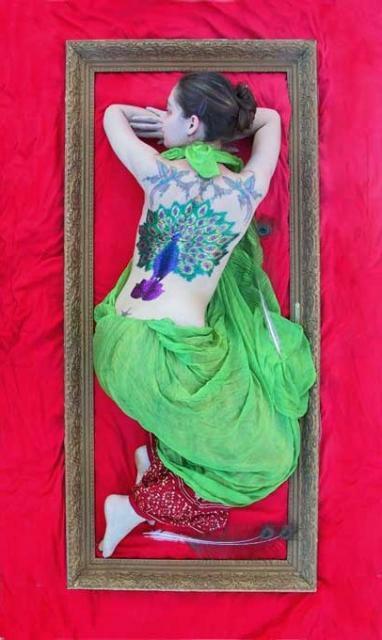 The peacock is liquid latex body art. The shape is painted on in liquid latex (which is black.) 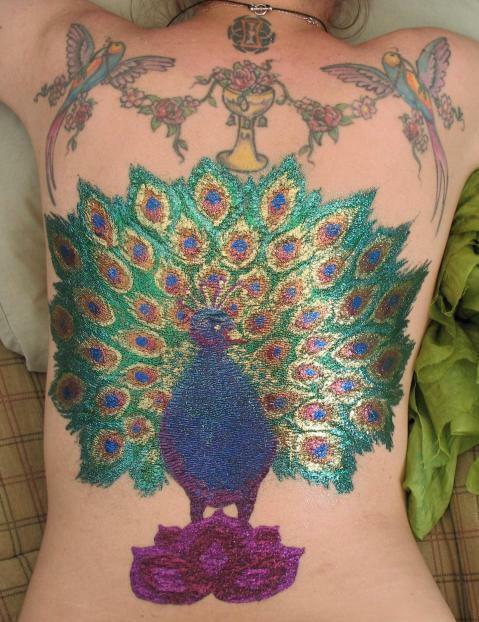 Then the artist put colored glitter on the wet latex to make the design. It took a while. I had it done at a body art festival in NY a couple years ago. The 2nd pic is copyrighted by some guy that was making a photojournal of the festival for publication. I chose an india blue peacock on a lotus flower. I think it turned out very nice. It lasted about 2 weeks, then I peeled off the latex and kept parts of it to put in a scrapbook. * Click on the pics to make them larger. The Birds on my shoulders and the cup of flowers really are tatoos. I currently (March 2010) have: an increasingly tolerant husband, a son, a daughter, a cat, my DH's cat, a doberman, 2 horses, and a bunch of chickens. I sell hatching eggs and chicks. Local pick-up or shipping available. I'm a homeschooling mom, work as an RN for the commonwealth of PA, practice yoga, make my own CP soap, teach bellydance, play flute, ride horses, keep a garden, read, sew, paint, hatch chicks, oh, and I'm an excellent cook!